We used to go to the one in Greenville, OH when we lived there. The attraction was the “gum wall” at the drive through. For some reason someone started it and everyone followed. When you drove up you stuck your gum to the wall. I am sure it was less than sanitary. 🙂 But I love me a good Maid Rite—I need to make these this week! OOOOHHH! I’d love to see this gum wall in person 🙂 Hope you enjoy the Maid-Rites! I was just there a couple weeks ago and have a picture of the “wall” on my phone! Wish I knew how to add it here! Seriously, Julie?? That is soooo cool!!!! Mom still lives in Greenville & I drive though Maid-rite when I go visit. Gum wall is still there! That is awesome!!! Thanks for the smile and memories! I was just there last week and the gum wall is still there and goes all the way around the building. 🙂 Lovely. I am sure that helps the health department rating! My husband is grom Grundy Center – – can’t wait to try these! I hope you and your husband both enjoy them! They’re delicious! Do I brown the ground beef first? Sorry, Tiffany, I just saw this. I wasn’t alerted I had a new comment for some reason. No, you don’t ground the beef first. Just throw it in. Hopefully you were able to figure it out when you needed it! Four hours on high…have you ever tried leaving it for 8 hours on low? I have been to Marshalltown (Taylor’s) and to Waterloo’ Maidrite. I enjoy all of them. There is also one in Ankeny that serves sweet potatoe French fries that are out of this world. Yum!!! I am so ready to fix this,I love maidrites. Heck yeah. I try to make it to canteen as often as I can. I like them better than maid-rite. As a born and raised Marshalltownian, I look forward to using this recipe and see how closely it resembles the original. I live in northeast Iowa now and make it to Marshalltown a couple times per year. Every time I go, I hit Taylor’s around 10:30 in the morning for a late breakfast/early lunch, do my business in town, then hit Zeno’s Pizza on the way out. There’s no place like home. We had a Maid Rite in Webster City…..Oh how I miss them…Thanks for sharing….. Gathered at WC Maidrite after football games and ate them with waffle fries. We celebrated so many victories with Coach Rollinger’s teams. Sherry – I use extra lean beef and never have much grease to deal with. They are great! Maid Rite in Quincy, Il. Every time I go “home” we all go to Maid Rite, wonderful. “Real” Taylor’s Maid-Rites are just steamed meat – the onions, mustard and pickle are placed on the bun before adding meat. That’s right, just meat. 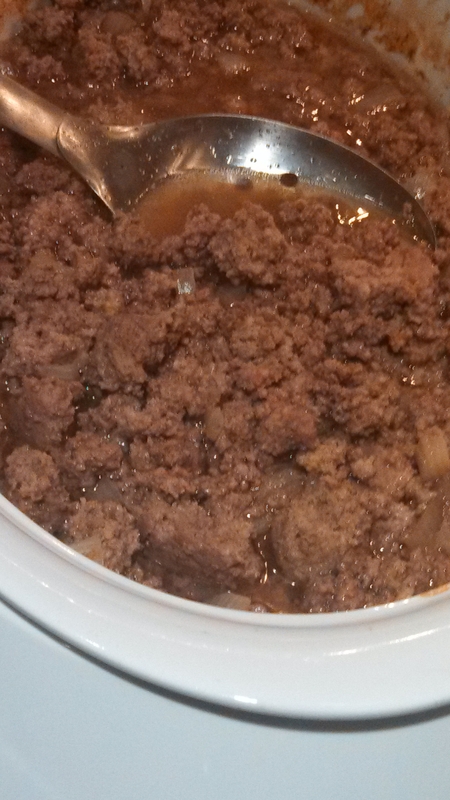 Try cooking the ground beef in the micro-wave, that steams it and it is close to Taylor’s. I grew up a block away from Taylor’s. There are no spices in the meat which made it unique. Your crock pot recipe sounds delicious, but it is not a Taylor’s taste. Hopefully you’ll give it a chance 🙂 I like them but I’m sure there is no match out there for Taylor’s! That’s what makes their sandwiches so special! I assume you cook the meat first? Hi Kim! No, actually you just put the meat in uncooked. Just make sure to stir it occasionally so you can break the meat up. You’re going to love them. They are a favorite around here because they are so good, and I like that they’re easy! the original maidrite was in Muscatine.and the secret was cocacola surup. Just to make sure I was’t told wrong look it up in wikapedea tne first was in Muscatine He was a butcher there and called them loose meat sandwich at first. The First maid-rites were made in Muscatine Iowa, I have a paper but can’t find it with the story. Can’t remember his name but he started making this sandwich and a delivery man came in and he tasted it and said that is made right. So this is what they named the sandwich. Andree – His name was Fred Angell. I didn’t know the story of how they were named…the delivery man hit the nail on the head with that one 🙂 Thanks for sharing! We used to have a Maid-Rite in my hometown of Seymour, Indiana. It was gone by the early 60s. I was very young so I don’t remember it well. My parents used to go there a lot. Maid-Rites (loose meats or taverns, as I’ve heard them called) are to Iowa what Runzas are to Nebraska. You won’t find them anywhere else, and if you do, they won’t be as good. If I were to half the recipe, should I still cook it on high for 4 hours? Meghan – I have never halved this recipe. I would guess that if you only made a pound and a half of meat that you would not need to cook it for 4 hours. If you’re going to be around while you cook it, you could always check on it and see. Otherwise, your better bet may be to plan on a longer time of cooking…like 6-7 hours and cook it on low. My suggestion would be to make the whole thing and then freeze your leftovers. It freezes very well and then the next time you want them, all you have to do is pull it out of the freezer, thaw it out, and then warm it up when you want to eat…easy peasy!!! 🙂 Hope that helps! Thank you Debbie! I will do that instead! Nice article. I love maid rites also. There is also one on interstate 80 west at the wings truck stop. I am not sure what mile marker or exit but it is near where you turn north to go to Denison. I introduced these to one of the guys from Nebraska I worked with. He loved em. I looked at your recipe, but I learned a secret recipe from a friend. Served years ago at a restaurant in Beaverdale, Iowa (Des Moines). They were called Reed burgers. Your recipe is missing 4 ingredients. Oooohhh…I wish I had the secret ingredients…are you sure you don’t want to give them to me?? 🙂 I guess this recipe made in my Iowa home will have to do. 🙂 We love them! Love it reminds me of similar loose meat sandwiches in WI. Ottumwa, IA used to have a Maid-Rite, annd I liked them. Ottumwa also had, and still has, the original Canteen, in the alley. I’m telling you, they are fantastic!! In fact, I had one today!!! If you’re in Ottumwa, you really should syop and get one. You won’t regret it. Liike Don said you won’t regret trying them, they are messy and flavorful completely. my family grew up following the iowa section of the eisenhower hiway system my dad help build. we visited many maid-rite shops. and some where right next to the railroad.i wish i could remeber all the towns. am looking forward to making this recipe. Bruce – That is such a neat story. Thank you for sharing! I hope you enjoy this recipe! On a recent trip up I-90 we stopped in Lamoni, IA at the Amish County Store which has a Maid Rite shop inside…. Good memories! Maid-Rite is still in St. Joseph, Mo. Love them. I was born in Newton where my parents were born and raised. Moved away when I was 3 mos old but I feel like I grew up on these. My request visiting newton was to have one every day. Now I live in Utah and lo and behold there’s a maid rite in Layton ut. I’m in heaven. Always give a spoon when the maid-rite is served. That’s the fun part when the sandwich is gone. I lived in Tama, IA for the first 8 years of my life and my grandmother and aunt and uncle lived in Marshalltown. Taylors was always a favorite place to go. Each time I go back, I’ve got to have one! The Big T Maid-Rite is in Toledo, IA and my niece works there! Will save the recipe for sure! Everyone from Quincy IL goes on and on about the Maid Rites there. All of us that have moved away just have to go when we get a chance to come home to go there. I move to Quincy in 1971 and Maid Rite was the place to go then, they had 2 stores when I left in 1993, but the original store was the best. We had a Maid-Rite in Keokuk Iowa where I grew up. Loved them!!! My father and grandfather were friends with Fred Angell from Muscatine. My Grandfather knew the recipe but in our family it died with him. He would never give it out in respect for Fred. I worked at a Maid-Rite as a teen in Fort Dodge Ia. I never tired of eating them. We cooked a lot of chicken there too, and I was off of chicken for several years. Just got sick of the smell–but never with the maid-rites! They were almost addicting. Oh Yes! I do remember Maid-Rites. 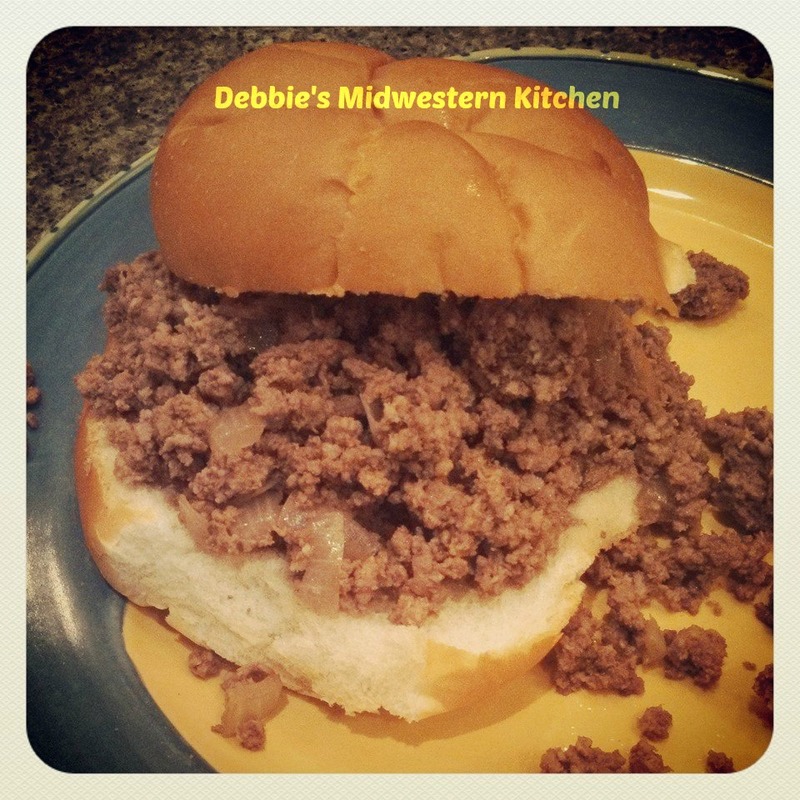 Try Debbie’s recipe. the Maid-Rite in Marshalltown is the original one. The Maid-Rites are original, but the building isn’t. It was built in the late l950’s. The original one was across the street and a little to the south. It was a hole in the wall. Seven genrations of my family have eaten Marshalltown Maid-Rites at one location or the olher. Hi Sharon – I remember reading that when I researched about the history of the Maid-Rite. I had just meant the original in terms of the actual Maid-rite, not necessarily the building. It would be fun to see the original or at least pictures of it. 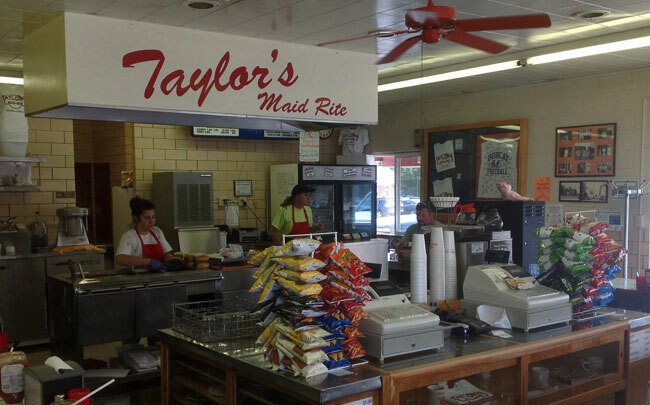 Your family must thoroughly enjoy the Taylor Maid-Rite’s to be faithful for seven generations! I’m sure you have many stories from years of your family members eating at these locations that would be fun to hear! My first memory of Taylor’s Maid Rite in Marshalltown is stopping on our way to the state basketball tournament in Des Moines. It became a tradition that if we went through Marshalltown, we ate at Taylor’s. When my Dad passed away, I drove down on his first birthday following and ate at Taylor’s in his honor. Great memories! Jo – What a great story! That was probably a very special moment to go back there on your dad’s birthday. I would guess it was an important part of the healing process. So special to have those memories! the Maid Rite in Quincy, IL was visited by Alton Brown from the Food Network a few years ago. He tried his best to get the owner to tell him the recipe with no success. These sandwiches are the best but I can’t wait to try your recipe and compare. I am wondering about your tbsp, I have seen that as written as Tablespoon, & teaspoon. which one do you mean? Tricia – It stands for a tablespoon. tbsp = tablespoon and tsp = teaspoon. Hope that helps and that you enjoy your Maid-Rites!!! Thanks, that’s what I thought, just checking though. Thank you Debbie! I grew up not far from the original Maid Rite in Muscatine, but more often enjoyed the version put out at the livestock sale barn counter in my hometown of Columbus Junction. Loved these things. I’m just getting ready to make a double batch for my four teenage sons…they don’t last long. Thanks for the trip back down memory lane. Thank you for the recipe. We still have Maid Rites in the Iowa, Illinois Quad Cities but over the years they have lost something. They are too dry. Years ago my work mate would say, “If you’re only gonna get one, why bother?” Can’t wait to try this!